Kaleidoscope City Review – AiPT! I’ve experienced two New Yorks: one is the nebulous metropolis that serves as the backdrops for media like Friends, Seinfeld, and The Avengers, and the other is the real city that, in late 2016, I visited for the first time on a trip to the East Coast. During my time in New York, I never got the sense that I had seen the city completely. Instead, it always felt like there was always more that I could see and unravel. Every street brought with it the revelation that I knew less and less about one of the most well-documented cities in the history of TV, film, and literature. Perhaps the most poetic idea of New York comes, quite accidentally, from the Wikipedia page for the “List of films set in New York City,” which I went to while trying to remember the name Sleepless in Seattle, the classic romantic-comedy film starring Tom Hanks and Meg Ryan that ended at the Empire State. Wikipedia notes that the entry “is a dynamic list and may never be able to satisfy particular standards for completeness,” and there’s something remarkably true about that pragmatic sentiment. No city, especially New York, will ever reach completion. 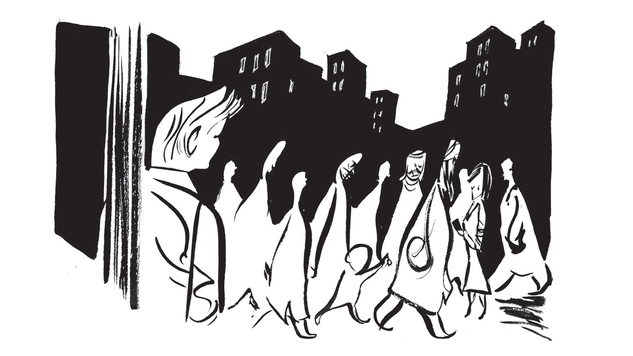 And that’s what New Yorker cartoonist and children’s book illustrator Marcellus Hall captures in Kaleidoscope City. Kaleidoscope City is, by and large, a series of fleeting feelings about New York within the framework of the city’s different seasons. It’s not at all surprising to learn that Hall is a musician, as there’s a musical quality to the entire book. The book’s vignettes all feel like part of a whole that, though different, contribute to an overall sense of what the city means. There’s no real conventional through line connecting the events. Instead the book, which is separated into four sections based around a season, feels like a series of meditations on the experience of New York without necessarily trying to compact the experience of New York into one series of events. Kaleidoscope City never feels like a completed story. Instead, it feels like free improvisation, rendering it more true to life and the character of New York than a conventional story might allow. Hall’s art is minimalist, taking advantage of the interplay between light and dark to render New York as something fleeting, ungraspable in its detail. Most pages are sparse, containing only a few panels — many of which don’t have any sort of defined border. Although this is conceptually appealing, there is a drawback to this in that Kaleidoscope City doesn’t take very long to read, which is a shame. Surrealism also plays a key role in Kaleidoscope City, as well. Hall never clearly affixes the boundary between the real and the imagined, with scenes often taking a decidedly surrealist turn. The choice to embrace surrealism in the graphic novel is admirable and allows Hall to render New York as an amorphous entity that changes and interacts with both the real lives and imaginations of its inhabitants. As a conceptual piece, Kaleidoscope City succeeds. There’s no overarching story, but there doesn’t need to be. Rather, New York is a city of feelings and impressions happening and waiting to happen. Were Hall trying to tell a narrative story, I’d critique him for the book’s lack of purpose, but the vagrant quality Hall injects into the story is precisely the point. Kaleidoscope City isn’t a book about its unnamed narrator; it’s a book about the city itself as seen through the eyes of a character that can only ever comprehend the part and never the whole. Kaleidoscope City is a great exploration of New York that puts the city itself front-and-center. The lack of a traditional narrative gives the book a unique feel. Due to the low panel count, it's a fairly quick read.